In 2018 it is expected that the government under President Joko Widodo will proceed with implementing economic reforms in order to improve the investment climate. By improving industry competitiveness and consumers’ purchasing power, the government aims to attract more foreign direct investments, to broaden exports and develop tourism. However, the government has been less successful in combatting corruption and reducing bureaucracy (mainly due to obstacles at the local government level) and in removing long-standing protectionist rules governing trade and foreign investment. Indonesia´s decentralisation after the end of the authoritarian rule of President Suharto still impedes policy coordination for infrastructure development, often leading to spending inefficiencies. The three main parties - DP, Golkar and PDI-P - endorse the Pancasila principle and thus the secular character of Indonesian politics. But the influence of fundamentalist Islam on the society has increased in the last couple of years, leading to intolerance against certain sects and the Christian minority. 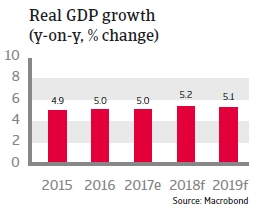 Indonesia´s short-term economic prospects are positive, with real GDP growth expected to remain at about 5% in 2018 and 2019, mainly driven by domestic demand. Private consumption is robust due to lower credit cost, increasing employment and an expansion of social welfare. Investment growth is driven by infrastructure improvement (construction of new roads, ports and power stations). The government deficit is forecast to decrease to 2.3% of GDP and probably average around that level in the coming years, despite a rather low tax revenue base. The scrapping and/or lowering of subsidies on energy since 2015 has helped to keep the budget deficit under control. Public debt is expected to stay at a sustainable level of about 35% of GDP over the next five years. 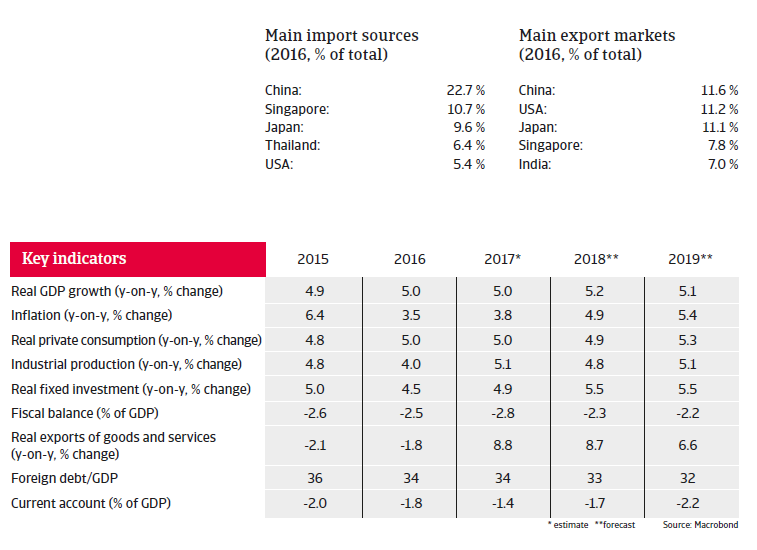 While exports grew strongly in 2017, the increase is expected to slow down somewhat in 2018 and 2019 due to lower demand from China. A potential hard landing of the Chinese economy would have a large impact on Indonesia’s export sector, however, such a scenario seems rather improbable currently. In any case Indonesia’s strong domestic sector would moderate the impact. 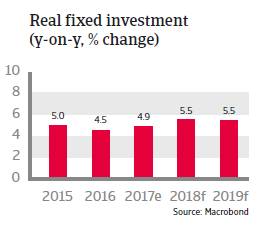 Indonesia’s external position has improved but remains vulnerable, due to a high dependency on portfolio investments for financing its persistent current account deficits and increased private sector external debt. This makes the economy susceptible to sharply decreasing capital flows to emerging markets, e.g. triggered by further monetary tightening in the US. In such a scenario Indonesian companies that have borrowed in foreign exchange without hedging the currency risk could have problems with their debt obligations, especially if the rupiah were to sharply depreciate against the USD. 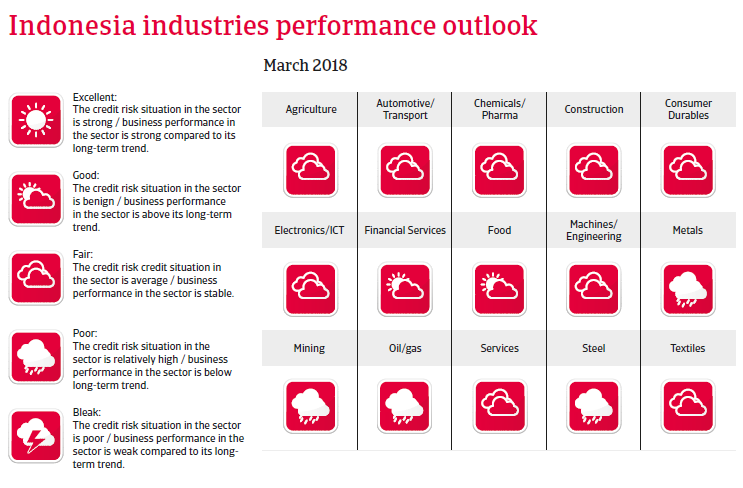 That said, Indonesia´s vulnerability to shifts in investor sentiment is mitigated by sound monetary policies, a resilient banking sector and the fact that a large part of public external debt is long term. 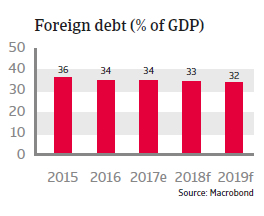 Due to robust GDP growth the foreign debt ratio is on a downward trend. Foreign debt in relation to exports of goods and services is decreasing as well, diminishing Indonesia’s dependency on foreign capital. International reserves remain rather strong with an import cover of more than eight months. Therefore, Indonesia´s external economic situation remains robust, and despite the fact that a further increase in interest rates by the US Federal Reserve in 2018 could put downward pressure on the exchange rate, a strong depreciation of the rupiah is not very likely as investor sentiment towards Indonesia is improving. As the economic situation is positive and the country's vulnerability to external shocks has declined with decreasing foreign debt, the Atradius STAR Political Risk Rating has been upgraded one notch to 4 (Moderate-Low Risk – Negative). As competition is fierce in the domestic market price wars cannot be ruled out, particularly among businesses operating in the lower quality segment.